As 40% of Auckland’s carbon emissions are due to transport, if Auckland is to contribute its share to NZ’s carbon reduction targets this is an area where reductions have to be made. A significant proportion of the emissions come from vehicles on our roads and so I thought I would ask AT what they are doing to address the situation. AT has two sets of targets. Fuel usage targets are set out in the Sustainability Framework. Carbon emission targets are set in the Low Carbon Auckland Annual Update. The fuel usage report also provides an indication into the inroads that AT is making into congestion. We would expect fuel use to be dropping very slightly because of the small number of electric cars and also because of the increasing fuel efficiency of modern cars. However, while the importation of new cars is at record levels the age of the fleet is still over 14 years due to the very high imports of used cars. I asked AT how they were performing against the important targets. I have interspersed commentary amongst their answers. Auckland Transport’s response to your request for information is as follows. 1) Auckland Transport’s Sustainability Framework of 2017 indicates in Figure 7 that the target is to reduce millions of litres of fuel used from the current level to 1400 per year. (I note that the current usage has increased by 7.7% since 2009, a time during which AT has made the most significant improvements to public transport and cycling). Please advise whether this is still a target. Figure 7 of AT’s Sustainability Framework is reproduced below. The figure references an interim target from Low Carbon Auckland developed in 2014, identified in the Appendices of Low Carbon here. This target was an interim target identified for transport as an assumed transition toward the 2040 target included in the Auckland Plan. The target is still an interim target and, as highlighted in the Appendix, the targets ‘are aspirational/indicative of the contributions needed to achieve the GHG reduction targets, by 2040’. In this context, it is an interim target until it is refreshed/replaced. In February 2018, Auckland Council’s Environment and Community Committee committed to refresh Low Carbon Auckland as part of developing the Auckland Climate Action Plan over the remainder of this year. Commentary: Of course it is an interim target because the final target is in 2040. Isn’t the sensible way to achieve a long term goal to set small, measurable, achievable targets along the way? 2) If the answer to 1 is yes, please advise what specific measures AT has to meet this target. (I note that AT has no major projects to come online in this timeframe,) As part of your answer would you please identify how each of these measures is predicted to contribute to the achievement of the target. Commentary: Yes clearly NZTA has a part to play in this because they control the motorways. However this is AT’s target and so presumably when they set the target they felt it was within their scope to achieve it? The most worrying aspect is that with the measurement 19% ahead of the interim target AT have no major action planned that will bring them anywhere close to the target. 3) I note that the Low Carbon Auckland Annual Update 2017 shows that the city is well behind the required carbon reduction target set by 2020. Please advise whether this still remains a target. As per response 1 above, the target is still an interim target in the context highlighted, until the plan is refreshed/replaced this year. 4) With respect to question 3, does AT believe that this target is attainable? Auckland Transport has not undertaken any subsequent specific assessment of the achievability of the target. 5) If one of the measures to question two is the proposed Auckland fuel levy please indicate the level that AT recommended to Auckland Council for this to be set at. The Auckland fuel levy is intended to generate additional funding rather than achieve emissions reductions targets (so falls outside the scope of Question 2 Above). 6) Please provide information how the proposed Esmonde Road flyover will contribute to achieving fuel usage targets and carbon emission reduction. The Esmond Road high occupancy vehicle lane project is still at an early stage of investigation and no designs have been finalised. While we expect this project will have a positive effect, no specific analysis of fuel usage impacts has been undertaken so far. Commentary: This question has little relevance and I just wanted to find out what was happening. 10) How does AT believe that the spend on roads in 2017 ($430 million compared to $336 million in 2016) is helpful to achieving the targets referred to in questions 1and 3? Auckland Transport has not generated any analysis on this issue. However, we note that the roading expenditure referred to includes both road renewal and new capital improvements. Road renewals are important to maintain the current levels of service of the network. The road improvement category covers a range of activities that occur within the road corridor, such as improvements for public transport, safety and walking and cycling as well as general vehicle movement. Commentary: The questions that follow are to ascertain whether AT could have made better spending decisions and diverted this money towards investment in public transport. I will explore this issue more fully in a subsequent post. 7) Does AT conduct the planned pavement maintenance programme according to a schedule e.g. a road resurfaced every seven years, or is it done on a needs basis? The Pavement maintenance programme is undertaken on a needs basis, cognisant of risk, cost and levels of service sought. 8) Does AT believe that any of this planned pavement maintenance programme could be deferred at no economic cost; that is the resealing is not more expensive when it is conducted? We do not believe this is the case. Deferral frequently brings higher cost and we do not consider this to be in the wider public interest. Commentary: It would have been much more reassuring to read, “we have empirical evidence” rather than “we believe”. 9) Why did the planned pavement maintenance programme spend increase so much from 2016 to 2017? The period identified reflects pre-implementation of One Network Road Classification (ONRC) and at that point these budget were dictated under the 2015/18 Long Term Plan. Network condition surveys undertaken in 2015/16 in preparation for the 2017 budget, indicated an increase expense was warranted to maintain the existing levels of service in support of achieving the Long Term Plan targets. Commentary: The surveys that “indicated an increase expense was warranted” seem a very soft reason for spending an extra $38 million. 11) The most recently proposed AT budget has been criticised. Does AT believe that moving some of the current expenditure on roads to public transport is necessary to achieve the targets in question 1 and 3? 12) AT often speaks of a carrot and stick approach to encouraging people to use public transport. Please supply the most recent documents /records of discussions where AT has addressed “stick” approaches. Auckland Transport has not generated any specific analysis of ‘stick’ approaches..However, Auckland Transport does undertake a number of demand management initiatives. For example, Auckland Transport is working with other government agencies on the potential for congestion pricing to improve transport outcomes. Commentary: In most businesses when the operation fails to meet some of its targets,(in this case fuel usage and carbon emissions), the normal response would be to consider all steps to correct the situation. 15) Does AT believe that the target mode share for vehicles of 76% for Takapuna in 2046 is consistent with AT achieving carbon emission targets? There is no target mode share for vehicles specifically applied to Takapuna. We assume the 75% figure you are referring to was derived from consultant advice on projected short-stay parking demand in Takapuna, and simply expressed what the estimated demand would equate to in mode share terms. Commentary: Business activity is expected to triple by 2046 and the population increase four fold. Is Takapuna going to be a hell hole where the town centre is clogged by motor vehicles if 76% of the trips are by car? The results of these questions show that AT in the area of congestion and carbon emissions has performed as badly as they have done in the area of safety, highlighted in the post of a few weeks ago. This is of course against a backdrop where the government of the time seemed to have little commitment to making real change regarding carbon emissions. It is a concern that AT still seems to have little in place to make an immediate difference to either congestion or carbon emissions. The big projects like the CRL or the light rail lines are still years away and public transport ridership increases are not matching the increase in travel trips in Auckland. Realistically what is the point of this target? Is AT really going to force people out of their cars to meet it? Or are they just hoping if they set it far enough into the future that technology will meet it for them? It’s just another way to try and force Auckland Transport to stop people driving their cars. 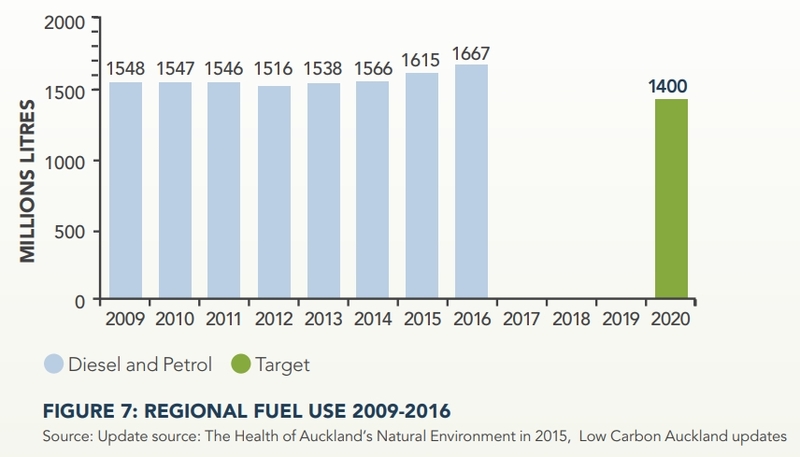 If we are adding 800 new cars per week to Auckland because people find it convenient to use their cars then overall fuel usage is going to go up, despite the more efficient car fleet. If we all swapped to electric cars tomorrow then this blog will have to try and find another way to try and force people to stop using their cars. Really the problem is not Auckland Transport’s – it’s government immigration policy that has meant there are a lot more people in the city (not trying to argue whether immigration is good or bad here). There are more cars and as a result fuel usage doesn’t come down as much it would do if people were just replacing older cars with more efficient cars over time. The main reason for the dramatic increase in population is not a dramatic increase in immigration, it is a sharp decrease in emigration. Neither emigration or immigration seem to be part of the govt’s climate change plans. A population plan would make sense before making commitments to reduce CO2 – alternatively make all targets per capita. besides if these supposed immigrants were not emitting carbons here theyd still be emiting carbons in whatever other country they lived. per capita would be good, eh Bob? An international one, at a level that will halt and reverse climate change. Here’s the latest info release from Stats NZ for International travel and Migration for May 2018. It shows there has been a dramatic increase in immigration, beginning 2013. As a result NZ’s population growth rate is the second highest in the OECD, exceeded only by Luxembourg which is in an entirely different situation. If I’m reading it right that figure also includes New Zealander’s returning from Australia and other parts of the world, which took off as the mining boom in Australia ended. Yes but there are still more NZ citizens leaving than arriving, the 70000 per annum NET gain of the past few years is entirely due to non-NZ citizens. It’s very noticeable that the increase in immigration from 2013 coincided with a sudden uptick in Auckland fuel use after years of static or declining consumption. Vehicle kilometres travelled are determined by roading capacity. This is fully within AT and NZTA’s scope and where they need a complete mindshift. Population is a red herring; population can increase while vkt reduces; Auckland has more opportunity than most in this area because of our high car dependency. It’s about good planning, and this is what is lacking. Don’t let AT and NZTA off the hook for proceeding with road building programmes when they know the induced traffic it will cause. Duranton and Turner have established that a city’s increase in roading capacity is matched % for % by its increase in vkt, using every piece of data for the US they could find. Last year, a similarly huge study confirmed it for Europe. In the European study, they confirmed too that each 10% of increase in roading capacity led to not just 10% increase in vkt, but to a 1% increase in air pollution. I don’t really have a problem if people are able to travel. More roading means people are able to make more trips, go to more shops, See their family more frequently et cetera. Over time as we improve our vehicle fleet the pollution issue will become much less. Stefan, you’ve said how inconvenient public transport is. Now let’s think about a city from the point of view of someone who cannot drive. The many people in this category must be designed for. Their considerations are important; at least as important as someone who can drive and therefore who has some choice. Auckland has choices – to date our decisions have been largely about roading, and Auckland therefore fits into one ‘type’ of city. This type is characterised by poor access for all users, poor urban form, lots of sprawl, lots of teenagers, lower-income people and elderly with limited transport choices and therefore social problems. The type of city that has made different choices, in which other modes are given higher priority, such as Copenhagen, is characterised by good access for all users, good urban form, the happiest teenagers in the world, and most notably, world-class driving conditions. Auckland can’t be held back from making better decisions because some people don’t understand induced traffic. Please take the time to understand how building roads will make it worse for all users. road pricing mechanisms will be necessary. Of course if all motorists simply paid the road charge then there would still be the same level of congestion. I think, not unsurprisingly perhaps, some here have said, that just doesn’t make sense – what can we do to actually prevent congestion and so Matt and others have come up with really clever solutions such as the Congestion Free Networks. I understand that doing your bit to help NZ Towards carbon zero by changing your lifestyle may not be your thing, especially as it all seems necessary due to immigrants, and no one expects you to. You will be able to feel that you are helping by paying the road price, maybe an increase in the gst on fossil fueled cars, and possibly more for parking. All this revenue will build the CFNs that others will use to directly influence congestion and emissions. But you will be doing your bit and on behalf of a grateful nation let me be the first to thank you. Thanks for your detailed reply. My point was, if we were all using electric vehicles the climate change issue would not be relevant, but despite that, there are many people on this blog who are very anti-car, even if cars were not making any difference to the climate. So people are utilising the climate change issue to try and stop people driving cars when in fact that is quite a fixable issue. I do care very deeply about the environment but I’m more worried about pollution. Our older vehicle fleet does produce quite a lot of pollution. In Australia the car industry is trying to push for tighter controls on the amount of sulphur allowed in petrol. I would consider that a far more important campaign than worrying about carbon dioxide emissions, assuming that New Zealand has similar poor quality petrol as Australia does. I do my part in terms of trying to reduce pollution by purchasing a newer car which produces less pollution and is substantially more fuel-efficient. I do think it’s great if we reduce our fuel usage. But not at the expense of people being able to travel. Whilst public transport will work for some trips for some people it is not feasible for the vast majority of trips for people I know. Almost every trip on public transport that I take takes 2-4 times as long as in the car. So most of the time I would rather drive. If we build more roads then I spend less time in traffic and there will be a reduction in carbon dioxide emissions. I’m in absolute agreement about road pricing as long as it’s across the whole network. If you start pricing motorways for example then the arterial routes will become clogged. And I would also want to see a continuing improvement in roads as a result. I would still have some concerns about it being regressive, but I think it’s a better way of doing things than a fuel tax. Your concerns are all valid, Stefan. I particularly agree that pricing motorways will clog the other roads. The trouble is, Auckland has spent so much money on roads at the expense of other modes. If this approach was going to work, it would have by now. Instead people who don’t drive are left without opportunity, and everyone gets stuck in congestion unless they have found a way to avoid having to be in it. The people who don’t have choices – because PT takes so much longer, or because walking or cycling is too dangerous – are dependent on their cars. It doesn’t have to be this way. Would you like to take a look at the post implementation reviews for the big roading projects? Although their business cases were based almost entirely on reduced travel times, those improvements were very short lived. Within just a few years, the travel times were back to where they were, but the roading had induced more traffic (and more GHG emissions). So building more roads you will not be spending less time in traffic, after just a few years. Other approaches, of improving the other modes, instead have long-lasting benefits. I too quite enjoy the convenience of driving. However, what I don’t like about it is how the amount of traffic means I can’t even cross the road to get to the shops near home. It takes two minutes to complete a 20 metre walk as I have to go along the road and wait forever for the crossing cycle at the lights. It also means many people drop their kids at my local school. People driving everywhere, often on absurdly short trips to the Fish and Chip shop are destroying local environments. There needs to be much more focus on locals rather than through traffic. Heidi, I would argue that roading has worked pretty well. The problem is that we’ve added a massive number of people to our population but not increased the available infrastructure to take account of that. That includes public transport where clearly some of the projects like the northern busway work pretty well which makes it sensible to extend that concept elsewhere where we can do completely off road bus lanes – that works really well. Jezza, maybe I’m just more patient but I can walk to the local shops and don’t mind if it takes a minute or two to get across the road. Also very lucky that when the children are old enough I will be able to walk them to school and it will only be a 10 minute walk (maybe longer for short legs :-)). I can’t imagine ever driving to school. Would be a complete waste of time. Stefan, I presume if you are patient you would also be happy to have more pedestrian crossings, better pedestrian phasing at traffic lights and slower speed limits in town centres, even if it slowed your car journey down? We have spent the best part of 60 years building roads and it is progressively getting harder to get around Auckland, I don’t see how building more roads is suddenly going to change this. In addition we are now down to the most eye wateringly expensive roading projects. Sure you could in theory try and slow population growth, which might reduce pressure on infrastructure, but it will also reduce the revenue stream for building new roads etc. I think the $4.2 billion dollar annual cost of injuries and deaths might also be a contributing factor in reducing speeds and access where large numbers of cars and humans meet. The privilege to drive, like aircraft and firearms is not a right, and clearly needs to be regulated in a similar manner to avoid the 400 deaths and 12000 injuries per year. Seeing as these numbers have been at this level or higher for the last 60 years then the 40000 deaths and associated injuries have cost $250 billion dollars in present terms. A rather steep price for a poorly regulated privilege. Forcing people out of their cars is the wrong way to achieve the result. Encouraging people out of their cars is the way to achieve the result. Make parking in the city during the day less attractive. What 99% of people on this blog advocate. Here’s the table and immigration only increased dramatically from 2014. The problem starts way further back than that. I know that you argue that roads have been successful, but very few now see roads as the preferred solution. I know that you want more roads, but I think that the reality is that you won’t get them because that scarce resource, money, will be needed for public transport solutions that will move people far more efficiently than roads can. A number of factors will kick in over a number of years helping. Surely electric buses rolled out when they are able to would make a huge difference. Nb. What is the Esmonde Rd fly over project? Over the motorway what road to what? Electric bus not only have less carbon emission, it also have low noise. If all of our city bus are whisper quiet, pedestrians will have a peaceful relaxed environment to enjoy their walk in queen st.
As a side note, can we install engine start-stop system in our existing bus fleet? That would significantly reduce emission and noise in traffic light and loading/uploading passengers. Could work in mild weather times otherwise I guess no aircon or heater running. They are seriously pi$$ing in to the wind with their responses here…. Well we know from an OIA from John P in 2013 that the entire diesel passenger rail fleet used around 9 million litres…..
hmmm 9 out of 1500, oh so that’s 0.6 % – not exactly a stellar example to use as the top action, and I would guess that many of the others would have a lesser impact than this.. Excellent work, Taka-ite. For an organisation that employs plenty of engineers, AT’s responses are outstandingly inadequate. Engineers know that if an interim target is not met, then feedback needs to inform changes to the mechanism for achieving the target. AT have failed to do. Waffle to hide failure. Very, very disappointing, AT. Heidi, yes indeed, waffle to hide failure. And he has talked more specifically about the recent increase in Auckland transport carbon emissions which he put at 24%. I think AT is about to be held to account. It’s not AT, except at the margins, it’s the actions and policies of the central government going back to the 1950s. The last National government was totally about driving and road transport. I can’t think of any policy from them that would have reduced fuel consumption anywhere in NZ, totally the opposite. It’s definitely not the engineers making the decisions, leave that to the finance and commerce grads running the show. And it isn’t engineers replying with the letters, leave that to to the communications and law grads. Besides, few in power take emissions seriously. Auckland is a drop in the bucket. Even if we eliminated 100% of our emissions from tomorrow onwards, we are still going to drown in rain and waves over the next several decades. Courtesy of the rest of the world. Better off spending no money reducing emissions and spending it on mitigation, raising all our buildings onto stilts or moving to higher ground. Excellent. Looking forward to them being implemented. Failure to do so will obviously have a direct effect on our carbon emissions, so I hope that any pressure to **scale them back** is put in its place. That place is “irresponsible negligence of future generations, with medium term huge **financial implications**.” I hope there’s no one in AT considering such a move. Yeah, after we’ve ensured [car] traffic can flow properly I guess. Let’s start with simple things. Has that zebra crossing finally been installed on The Strand? Or is that considered too much of an impingement on traffic flow on that parking lot? The Strand is about to have the bulk of Quay St’s traffic run through it, so given it’s going to be the main access to the motorway, an uncontrolled crossing isn’t really a smart idea. Different Strand, Buttwizard. https://www.greaterauckland.org.nz/2017/02/08/bring-on-the-pedestrian-crossing/ Easy mistake to make, when you consider concerns for pedestrian amenity on The Strand in town too. 4) Then manage the transition of electric vehicles to paying full RUCs vs petrol/diesel vehicles paying higher fuel excise taxes so that the electric/hybrid fleet continues to grow. 6) Drop any thought of an absolute carbon target at 2050 – we should let the international carbon price (or proxies thereof) determine the rate of change. I’d like to know if they have a policy to reduce NOx and particulate emissions. My bet is that this is absolutely unlikely. Climate change is Jacindas’s top priority behind child poverty; it seems to be James Shaw’s top priority; and if the way that Winstone Peters conducted the interview on Newstalk today it is front and centre for him as well. I am also surprised at the rate that some of the corporates are starting to buy electric cars with Air NZ, Westpac and Waste Management purchasing significant numbers. I was particularly surprised that some of Waste Managements rubbish trucks are electric. It never fails: someone always blames “immigration” for Auckland’s population boom. Riddle me this, then: how are you going to stop “immigration” from the rest of New Zealand, or natural increase (i.e. babies) which have an equal if not greater impact on Auckland’s population? A Trump wall along the Bombay hills? Contraceptives in the drinking water? Or is it just folk from overseas who are the problem? Mmmm. Imagine our culture involved every household cutting down a large tree and burning it green, every night, letting it smoulder for several days, to keep a God appeased. Imagine the unnecessary air pollution and carbon emissions. Imagine the wasted space given to all those smouldering trees. Imagine all immigrants encouraged to do so if they want to fit in. Using the same logic used to blame immigrants for our transport carbon emissions, the increases in carbon emission and the sprawl due to the smouldering sacrificed trees would be blamed on immigration, instead of on the stupid cultural practice. And all this, despite clear examples of places where population increase has been large but carbon emissions have gone down, thanks to mode-shift. Agree. Auckland’s population has grown for years and will continue to grow. While it is going through a particularly strong period of growth at the moment, that will no doubt change and the population is less than it was forecast in the 1970s to be now. This is a failure to plan not a failure of too much immigration. Albert Street and AT’s inability to provide a way east from anywhere below Victoria St, heading down. Why is there no “straight ahead” option at Customs St? Back up Hobson St you go… or right at Market Place. As for air pollution, my car’s diesel and I’ve never seen or smelt anything, unlike every builder’s Hino truck and stinky Hilux, let alone the Kenworths along The Strand. I know, there’s NOx but particulate emissions are the worst, and despite the shame of Dieselgate, an Audi TDI or Skoda won’t be spewing a fraction of the filth of Ponsonby’s restaurant service trucks, left idling on bus stops. So let’s be a bit granular about diesel emissions, shall we?